Substitute El-Hadji Diouf scored against his former club as Blackburn twice came from behind to salvage a deserved draw against Sunderland. The game burst into life in the second half when Darren Bent tapped home after a scramble, only for Morten Gamst Pedersen to drill a fine leveller. Bent broke free to score his 13th goal of the season and restore the lead. 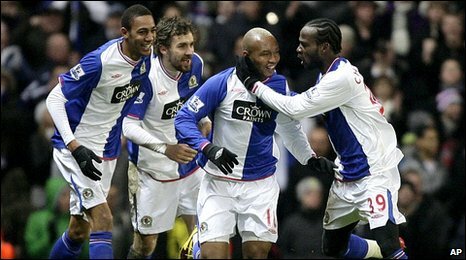 But Diouf came off the bench as part of a triple change to head home a cross from Pascal Chimbonda and seal a point. The Senegalese striker, who left Sunderland in the January transfer window, had only been on the pitch for five minutes and much credit must go to Blackburn manager Sam Allardyce for making such a bold set of substitutions. The result means both sides are still searching for their first win in the league since November, although Blackburn's five-hour wait for a goal at home has finally ended. Sunderland were never at their best and manager Steve Bruce will no doubt be counting the hours until the injured trio of Kenwyne Jones, Kieran Richardson and Lee Cattermole return. The hosts' winless streak before the clash stretched back seven games and with Sunderland having gone six matches without tasting victory, a classic never appeared likely. The opening stages were certainly indicative of two sides in such a rut, with a snap shot from Keith Andrews the closest either team could muster to a goal. Diouf was terrible bar the goal. Benni very good again - subbed for some strange reason. Roberts has to move on. David Meyler, making his debut in the Sunderland midfield, added some enthusiasm but a couple of long-range efforts did not trouble Paul Robinson in the Blackburn goal. Jason Roberts failed to control in the area after wriggling into space while another long-range drive from Andrews was deflected just over. Sunderland failed to get a foothold in the game throughout the first half, although a defence missing Anton Ferdinand, John Mensah and Michael Turner were thankful for so little to deal with. But out of nowhere the visitors went ahead after the break. A low cross from Daryl Murphy was only parried by Robinson and after a lengthy scramble, Bent popped up to slam home from close range. It was just what the game needed and inspired Blackburn, who levelled almost immediately. Pedersen latched on to a flick from Benni McCarthy and made the most of a slip from Phil Bardsley to run at goal, before rounding Nosworthy and drilling home off the post with his right foot. It was the least Blackburn deserved and they should have moved ahead moments later when a delicious cross from Pedersen was poked just wide by an airborne Andrews. 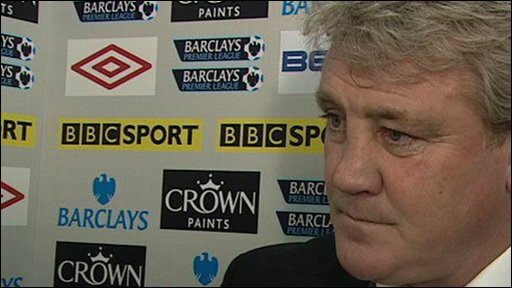 But Sunderland always looked dangerous on the break and their second goal came from a predictable source. A fine through ball by Jordan Henderson sent Bent clear and Robinson was unable to stop an accurate shot from rolling into the bottom corner. 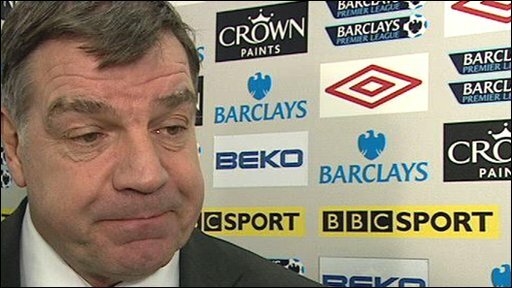 Allardyce responded with a triple substitution, sending on Franco Di Santo, Nikola Kalinic and Diouf. And it was the latter who got one over on his former club by heading home a Chimbonda cross to send the home fans wild. Blackburn should have won the game in the dying moments but saw Sunderland keeper Marton Fulop pull off a brilliant save to deny Ryan Nelsen, with Christopher Samba somehow putting the rebound wide when it was easier to score. "I'm pleased with the character of the team and what they showed out there. It also shows how important it is to have strength on the bench as it was crucial that I could send Diouf on. "Sunderland have gone out and bought a man who scores goals. If we had a man who had scored 13 in the league like Darren Bent then we'd be in a different position. "I don't think you can add up the goals from our strikers and match what he's scored. "We haven't got the clout to go out and buy a Bent or a Peter Crouch. I don't think there's anybody out there in the European market that could change things. "We've made hard work of it but we still had the opportunity to come back and win it. Thankfully we found a couple of goals." "I've got to be happy with a point with the suspensions and injuries we've got. I had nine players out and that's a lot to deal with. "I'm a little bit disappointed because we went in front twice. But we'll keep plodding away. "It was possibly the worst game of football I've ever seen in the first half. But Blackburn always ask you questions as they get the ball into the box from very angle." 90:00+4:45 The game is over, as the referee blows his whistle. 90:00+4:14 Free kick taken by Keith Andrews. 90:00+4:14 Booking Paulo Da Silva goes into the book for unsporting behaviour. 90:00+4:03 Free kick awarded for an unfair challenge on Franco Di Santo by George McCartney. 90:00+3:35 Outswinging corner taken by Daryl Murphy, clearance by Pascal Chimbonda. 90:00+1:00 Free kick awarded for an unfair challenge on Franco Di Santo by Lorik Cana. Keith Andrews restarts play with the free kick. 90:00+0:49 Shot from 25 yards from Jordan Henderson. Save by Paul Robinson. 89:12 Free kick awarded for an unfair challenge on Pascal Chimbonda by Daryl Murphy. Free kick taken by Paul Robinson. 88:22 Christopher Samba produces a right-footed shot from close range which goes wide of the right-hand upright. 87:33 Morten Gamst Pedersen sends in a cross, Ryan Nelsen takes a shot. Save made by Marton Fulop. 87:33 Booking The referee cautions Phillip Bardsley for unsporting behaviour. 87:29 Phillip Bardsley gives away a free kick for an unfair challenge on Gael Givet. 86:09 The ball is sent over by Morten Gamst Pedersen, Header from close in by Nikola Kalinic misses to the right of the goal. 85:41 Centre by Morten Gamst Pedersen, save made by Marton Fulop. 81:06 David Meyler challenges Pascal Chimbonda unfairly and gives away a free kick. Morten Gamst Pedersen has an effort direct from the free kick, save by Marton Fulop. 80:30 Free kick awarded for an unfair challenge on Keith Andrews by Phillip Bardsley. Direct free kick taken by Paul Robinson. 79:47 Daryl Murphy produces a cross, Gael Givet manages to make a clearance. 78:33 Corner taken left-footed by Daryl Murphy, Pascal Chimbonda makes a clearance. 77:53 The referee blows for offside. Phillip Bardsley takes the indirect free kick. 76:37 Assist on the goal came from Pascal Chimbonda. 76:37 GOAL - El-Hadji Diouf:Blackburn 2 - 2 Sunderland El-Hadji Diouf grabs a headed goal from inside the area. Blackburn 2-2 Sunderland. 76:22 The ball is delivered by Franco Di Santo, Lorik Cana manages to make a clearance. 75:24 Free kick awarded for an unfair challenge on Christopher Samba by Darren Bent. Paul Robinson takes the free kick. 74:10 Keith Andrews has an effort at goal from just outside the box which goes wide of the right-hand upright. 73:24 Substitution (Blackburn) makes a substitution, with El-Hadji Diouf coming on for David Hoilett. 72:07 Substitution Benedict McCarthy goes off and Franco Di Santo comes on. 72:07 Substitution Jason Roberts goes off and Nikola Kalinic comes on. 71:45 Keith Andrews takes a shot. Jason Roberts gets a block in. 71:10 The official flags Fraizer Campbell offside. Paul Robinson restarts play with the free kick. 70:21 Lorik Cana takes a shot. Ryan Nelsen gets a block in. 70:10 Darren Bent produces a drilled left-footed shot from 20 yards. Save made by Paul Robinson. 69:36 Gael Givet has a shot on goal from outside the box which misses right. 68:30 Paulo Da Silva gives away a free kick for an unfair challenge on Jason Roberts. Morten Gamst Pedersen has an effort direct from the free kick, blocked by Benedict McCarthy. 67:20 Effort on goal by Steven Nzonzi from just inside the penalty area goes harmlessly over the target. 66:34 Effort from long distance by Steven Nzonzi goes wide right of the goal. 65:50 Free kick awarded for a foul by Jason Roberts on Paulo Da Silva. Marton Fulop takes the free kick. 64:37 The assist for the goal came from Jordan Henderson. 64:37 GOAL - Darren Bent:Blackburn 1 - 2 Sunderland Darren Bent fires in a goal from just inside the area to the bottom left corner of the goal. Blackburn 1-2 Sunderland. 63:33 David Hoilett takes a shot. Marton Fulop makes a save. 63:05 Pascal Chimbonda produces a cross, David Meyler manages to make a clearance. 62:17 Free kick awarded for an unfair challenge on Jason Roberts by Lorik Cana. Keith Andrews takes the direct free kick. 61:18 Phillip Bardsley takes the free kick. 61:18 Booking Benedict McCarthy receives a caution for dissent. 61:15 Handball decision goes against Benedict McCarthy. 60:40 The ball is delivered by George McCartney, Gael Givet makes a clearance. 58:57 Free kick awarded for an unfair challenge on Jason Roberts by Paulo Da Silva. The free kick is swung in left-footed by Morten Gamst Pedersen, clearance by George McCartney. 58:15 The referee blows for offside against Jason Roberts. Marton Fulop takes the indirect free kick. 56:48 The ball is delivered by Morten Gamst Pedersen, Close range effort by Keith Andrews goes wide of the right-hand upright. 55:12 The referee blows for offside against Fraizer Campbell. Free kick taken by Paul Robinson. 54:56 The ball is crossed by Morten Gamst Pedersen, comfortable save by Marton Fulop. 52:33 Assist by Benedict McCarthy. 52:33 GOAL - Morten Gamst Pedersen:Blackburn 1 - 1 Sunderland Morten Gamst Pedersen finds the net with a goal from just inside the area to the bottom left corner of the goal. Blackburn 1-1 Sunderland. 51:47 Daryl Murphy produces a cross, Jordan Henderson takes a shot. Blocked by Ryan Nelsen. 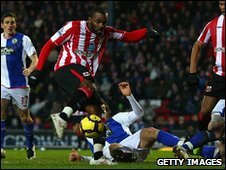 51:30 GOAL - Darren Bent:Blackburn 0 - 1 Sunderland Darren Bent gets on the score sheet with a goal from inside the six-yard box to the top right corner of the goal. Blackburn 0-1 Sunderland. 51:10 Foul by Keith Andrews on David Meyler, free kick awarded. Jordan Henderson takes the free kick. 49:35 Corner taken right-footed by Jordan Henderson from the left by-line, comfortable save by Paul Robinson. 48:23 Inswinging corner taken right-footed by Benedict McCarthy from the left by-line, clearance made by David Meyler. 48:10 Steven Nzonzi takes a shot. Blocked by Phillip Bardsley. 47:12 Shot by Jason Roberts. Paulo Da Silva gets a block in. 45:41 Jordan Henderson fouled by Benedict McCarthy, the ref awards a free kick. Phillip Bardsley restarts play with the free kick. 45:00+1:30 The whistle is blown to end the first half. 45:00+0:58 Shot from 20 yards from Jordan Henderson. Blocked by Ryan Nelsen. 44:06 Benedict McCarthy takes the inswinging corner, clearance made by Paulo Da Silva. 44:01 Centre by Morten Gamst Pedersen, clearance made by Nyron Nosworthy. 42:48 Benedict McCarthy is caught offside. Nyron Nosworthy takes the free kick. 42:07 Paulo Da Silva gives away a free kick for an unfair challenge on Jason Roberts. Direct free kick taken by Keith Andrews. 39:24 A cross is delivered by Morten Gamst Pedersen, clearance made by George McCartney. 37:34 Foul by George McCartney on Jason Roberts, free kick awarded. Morten Gamst Pedersen crosses the ball in from the free kick, clearance by Jordan Henderson. 36:31 Effort from outside the box by Keith Andrews goes wide right of the target. 35:47 Paul Robinson takes the free kick. 35:47 Booking Booking for David Meyler for unsporting behaviour. 35:41 Morten Gamst Pedersen fouled by David Meyler, the ref awards a free kick. 34:56 Inswinging corner taken from the right by-line by Morten Gamst Pedersen, save by Marton Fulop. 33:29 Free kick awarded for an unfair challenge on Steven Nzonzi by Lorik Cana. Benedict McCarthy produces a strike on goal direct from the free kick. 32:40 Corner taken by Morten Gamst Pedersen, Paulo Da Silva makes a clearance. 32:29 The ball is swung over by Steven Nzonzi, clearance made by David Meyler. 31:30 Inswinging corner taken right-footed by Jordan Henderson from the left by-line to the near post, Gael Givet makes a clearance. 29:05 Keith Andrews takes the direct free kick. 29:05 Booking Nyron Nosworthy receives a caution for unsporting behaviour. 28:58 Free kick awarded for a foul by Nyron Nosworthy on Christopher Samba. 28:15 Foul by Fraizer Campbell on Pascal Chimbonda, free kick awarded. Paul Robinson takes the free kick. 26:48 Benedict McCarthy fouled by Lorik Cana, the ref awards a free kick. David Hoilett takes the free kick. 25:48 Lorik Cana takes the chance to get an effort at goal. Steven Nzonzi gets a block in. 25:39 The ball is crossed by Jordan Henderson, clearance made by Morten Gamst Pedersen. 25:12 Keith Andrews challenges David Meyler unfairly and gives away a free kick. Phillip Bardsley restarts play with the free kick. 23:13 Shot by Phillip Bardsley. Paul Robinson makes a save. 22:15 Free kick awarded for a foul by Steven Nzonzi on Lorik Cana. Direct free kick taken by Paulo Da Silva. 21:40 David Meyler has an effort at goal from outside the area which goes wide left of the target. 20:55 Effort from outside the box by Fraizer Campbell goes wide right of the target. 18:43 Morten Gamst Pedersen crosses the ball, Headed effort from deep inside the penalty area by Benedict McCarthy goes harmlessly over the crossbar. 17:52 A cross is delivered by Pascal Chimbonda, clearance by Nyron Nosworthy. 17:21 Daryl Murphy crosses the ball, clearance made by Keith Andrews. 16:32 George McCartney crosses the ball, clearance by Ryan Nelsen. 14:00 Benedict McCarthy gives away a free kick for an unfair challenge on Nyron Nosworthy. Marton Fulop takes the free kick. 13:04 The ball is sent over by Benedict McCarthy, blocked by George McCartney. 11:05 Phillip Bardsley gives away a free kick for an unfair challenge on Morten Gamst Pedersen. The free kick is swung in left-footed by Morten Gamst Pedersen, clearance made by Lorik Cana. 10:46 Keith Andrews has an effort at goal from 25 yards. Blocked by Lorik Cana. 7:42 The ball is delivered by Jordan Henderson, Fraizer Campbell takes a shot. Save by Paul Robinson. 7:00 Effort from outside the penalty box by Keith Andrews goes wide left of the target. 6:23 Daryl Murphy concedes a free kick for a foul on Keith Andrews. Free kick taken by Paul Robinson. 5:22 Unfair challenge on Keith Andrews by David Meyler results in a free kick. Paul Robinson takes the free kick. 0:45 Jordan Henderson produces a right-footed shot from just outside the penalty box that misses to the left of the goal. 0:19 Keith Andrews produces a cross, Paulo Da Silva manages to make a clearance.